Two pieces of news came to me the other day, almost at the same time. The first was news we all heard: Alan Alda came out publicly to say he had been diagnosed with Parkinson's disease 3 years ago. As he was diagnosed quite early, before the classic symptoms of PD had begun, he is still just beginning this journey. Not long after reading this, I received a message to say Kate Kelsall had passed away on Sunday, July 29, ending her journey with Parkinson's disease. Ask anyone who knew Kate and the first thing you'll probably hear is "She was a force to be reckoned with". Kate took the Parkinson's community by storm. She had DBS surgery and, with Valerie Graham, was a patient liaison for patients having DBS and they started the Bionic Brigade support group. She talked Paul and Carolyn Zeiger into starting a support group for caregivers. She danced, played accordion, went to the World Parkinson Congress in Montreal, won a channel 7 Everyday Hero Award with Valerie, among many, many other things, and... she wrote a blog. Kate talked about her DBS surgery, dancing, her challenges with speech, her frustrations and her victories. She listed resources, talked about various forms of exercise, and discussed ways to make our lives better. She interviewed others and encouraged guest bloggers to allow her to publish their writing. She was the first person to publish my articles. I'm not even sure how she found out about my writing. She also wrote about death. She didn't even "dance around the D word". Kate talked about the death of her mother: "We fear that our Mom who suffers from Lewy Body Dementia (LBD) will either choke to death or starve to death." and "Aspiration pneumonia, a leading cause of death with Parkinson’s patients, often develops as a complication of mealtime swallowing problems, leading to the inhalation of food and drink." She answered one reader's question on October 16, 2007 with: "Frankly, my greatest worry is when and how I am going to die. The only blog posting that I started but didn’t finish was about dying with or from PD." I argued with Kate about this. We got together a few times and we corresponded a lot through email. She told me she certainly wasn't going to live to be 80 years old and that she'd probably die of aspiration pneumonia. I insisted that we don't die from PD, but with PD. She smiled. She was sure she was right. We argued amiably about a few other things, too, like whether one could drive with dystonia and the proper length for blog posts. This one would already be too long in her opinion. It's humbling to realize now, but Kate was right. When she died of aspiration pneumonia, 21 years after she was diagnosed, she was 67 years old. Parkinson's disease not withstanding, she barreled her way through life, always working to provide support and resources for people to make their lives better. It's really hard to imagine any Parkinson's function without her. Well, Kate, take a little breather then, wherever you are, keep on being the force you were here on earth. Sing! Talk and yell and shout and dance! You've finally left your PD behind for good. My friend, Ed Sikov, recently wrote a wonderful article about writing. With the title, "How Do You Know When Your Writing Career Is Over? ", I was almost too scared to read it, wondering if I'd find out my writing career should be over. It's way too easy for me to believe. Scared or not, I read it anyway. Ed's a friend. He's also someone I consider to be a real writer, he has written books and articles and gets paid to do it. Any advice he gives, I'll take seriously. Soon enough, Ed reassures his readers. All we have to do to be a real writer is... write. Write consistently. Don't say we're going to write, just do it. Don't stop because we get rejection notices or because someone thinks it's a silly thing to do (Ed words all this much better than I do). I would encourage any and all writers to read this article, more than once. Print it out and keep it handy for those times when you get discouraged. Then, about halfway through his article, he speaks about his diagnosis of Parkinson's disease and how this affected his writing. What he had been doing for years as a professional writer didn't work anymore. He didn't call it quits; he changed how he was writing. This article of his is proof he still is very good at what he does. I would also encourage any and all people with Parkinson's disease or other chronic health challenges to read this article, print it out, and keep it handy. It's easy to get discouraged when it's harder to concentrate, harder to find the fine motor control, harder to find the energy to do things we used to enjoy so much. We have to learn when to take a step back and change how we do things, not call it quits. Craft work was a huge part of my life for a long time. It's not that I cannot do it anymore, but the end product of my art work was no longer up to my standards. So I called it quits on a few things, like felting and artistic books. I couldn't think art anymore; couldn't get into that special art zone. I called it quits on broom making too, but that was for another reason; it's just too hard physically. I'm cleaning out my studio and giving a lot of art supplies away. I still make simple books from time to time and I knit. I don't think I'll be tackling any complicated lace patterns, but I can still do the basics. It's enough and it's very satisfying. I also write. Oddly enough, I didn't really start writing until after I was diagnosed with Parkinson's. This blog began as articles I wrote simply to help me process this new direction my life had taken. I finally put them on the website because I wanted to make sure I wouldn't lose them if my computer crashed. I didn't really expect anyone to read them. 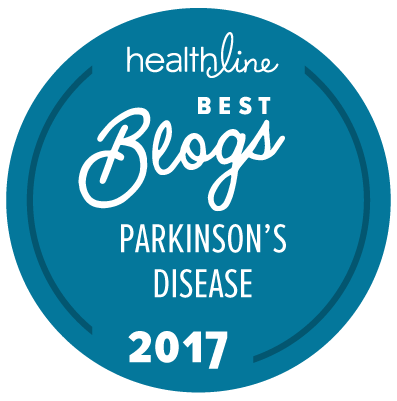 Perhaps this made it more exciting to hear I made the top 15 Parkinson's blogs of 2017, chosen by Healthline. I've made the list for a number of years now, but I never expect it. I've run across some wonderful new blogs by people with Parkinson's disease and, if there is a year I am not chosen, I won't be the least bit offended. I won't call it quits, either. Writing seems to be in my DNA. My father wrote his first novel at age 85. Our son, John, is becoming well known for his poetry, and our daughter, Emma, has had two of her short plays chosen to be performed. I'll do my best to keep up. Oh, and if you haven't done it already, read Ed Sikov's article. "Wolcum be ye that are here. Wolcum alle and make good cheer, Wolcum alle another yere, Wolcum Yole, Wolcum!" The music which always gets me in the Christmas spirit is "A Ceremony of Carols" by Benjamin Britten. It might seem an odd choice; though beautiful, it's not exactly the light, cheery music we hear in the stores or on the radio. Part of the reason it speaks to me is because our choir performed this work when I was a senior in high school. The concert came during a snow storm right before Christmas break. A professional harpist performed with us. Walking out of the school in the falling snow after the concert, the music was still very much alive in my whole being. It was magical! Britten's use of dissonance, varying rhythms, overlapping voices, and key changes make this a challenging work for a choir. From the reverent procession in Latin to the bright "Wolcum Yole!" in middle English, to the gentle lullabies then a plunge into the dark with "This Little Babe" , to the song of praise in "Spring Carol" to the energy and urgency of "Deo Gracias", we are carried on powerful waves of emotion and beauty through these carols. It's exhausting. This is not surprising when we learn Benjamin Britten wrote the music for "A Ceremony of Carols" while on board ship, a month long voyage crossing the Atlantic from North America to England in March of 1942. He was with his partner, Peter Pears, a well known tenor. They were personal as well as professional partners. This was also right in the middle of World War II and the sea wasn't the safest place to be, nor was England as bombs were falling on their cities. For the celebration of Christmas, peace on earth, goodwill toward men, Britten included both the harmony and dissonance which was the world around him. This is just right. Jesus wasn't born into a world of peace and goodwill, but into this struggling, imperfect one. Dissonance occurs in music when two notes which are discordant are sung or played at the same time; a major or minor 2nd is the easiest example. It's the sound of tension and our minds want to resolve the tension by coming back to the harmony of a 3rd interval. The dissonance itself is not pleasant to listen to and only can achieve beauty by the context and harmony which is around it. Listen closely to the music and we can hear the dissonance in Benjamin Britten's world. We hear the joy as well, but the tension is never far away. It is interesting he was inspired by poems of Robert Southwell, a Catholic priest who was executed in England in 1595 for treason; being a Catholic priest in England for more than 40 days was a crime punished by death in those days. Perhaps Britten, being a gay man in the 1940's, understood Fr. Southwell's devotion and the danger he had to accept. There's dissonance in our world again. Of course, there always is, but right now there seems to be more than ever. We don't know what to expect, but we dare not ignore what is happening, even if listening to the news sounds like fingernails on a chalkboard. We have elected a president who has publicly made fun of disabled people, constantly and consistently puts women down, is backed by the KKK and Russia, prefers to communicate through Twitter, isn't interested in hearing security reports, among many other seriously concerning behaviors. We dare not ignore the racist comments made by the man who has been his closest adviser. We dare not ignore it when people feel empowered to harass others because of the color of their skin, their nationality, religion, or sexual/gender identity. We must dare to stand up to this new administration and refuse to allow a Muslim registry. We must encourage our state and local leaders to refuse to be a part of this. There are people organizing. We don't need to do this alone. It's not one hero we need, but an entire chorus of voices. To be one voice in a chorus is to (to quote a friend) feel very small in a very big way. It's the acknowledgement that we are, and need to be, a community. "If thou wilt foil thy foes with joy, then flit not from this heavenly boy"
"Adam lay ibounden, bounden in a bond; four thousand winter thought he not to long. And all was for an appil, an appil that he tok, as clerkes finden written in their book. Ne hadde never our lady a ben hevene quene. How thankful we should be that we are human... imperfect as we are. To stand with our fellow human beings, especially those whom our society has repeatedly tried to squash (marginalize seems much to sanitary a word) and those who need our support, and helping each other to find joy, this I believe is the work we are called to do. Here are the carols, sung by the Copenhagen Boys' Choir and conducted by Benjamin Britten. Each song is relatively short, the entire work is about 20 minutes. Thank you to the Internet Archive for the recording and lyrics to Benjamin Britten's beautiful music and for making this available to share with others.